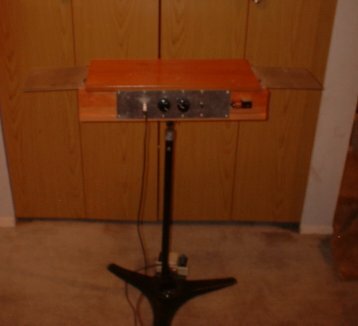 My Theremin is a homebuilt 7 transistor unit. It is known as the TECI Hybrid Theremin. It was built using plans that were from a kit offered by South West Technical products, 1974. These plans were an up-date of the plans that appeared in Popular Electronics, Nov, 1967. However, the coils called for in the 1974 plans are no longer available. I used the coils called for in the 1967 plans, and adapted the design as needed. Hence the "hybrid" specification. 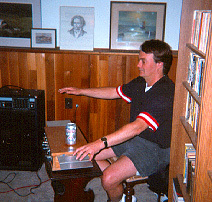 Hands Off Prince Rupert An impromptu Theremin jam session. theramin.mov Click to dowload a movie of Leon Theremin, New York City, circa 1927. Theremin.rm Click to download a Real Player movie clip of G. Dunbar Shewell and his son Lennington demonstrating an R.C.A. Theremin, circa 1931. 5.7 mb. Thersolo.mp3 3.4 mb. 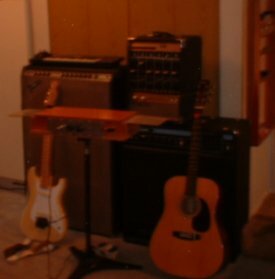 This recording was made in in 1997 at the Prince Rupert Performing Arts Center. Dan Gillard played a classical guitar practice piece. We recorded this and used the tape as accompanyment. My performance was part of a local Variety Show. This is a recording of the dress rehersal. Therjazz.mp3 5.1 mb. This recording was made at the below mentioned story, March 1, 1998. The completely Plugged Concert was a fund raiser for the Performing Ats Centre, and featured many local rock bands. When one one of the bands dropped out one hour before their scheduled performance, the theatre manager, a friend of mine, talked me into going home and getting my Theremin. When I returned shortly thereafter, he had rounded up a crew of musicians willing to experiment. I suggested that they do something they felt comfortable with, and I would just accompany them. 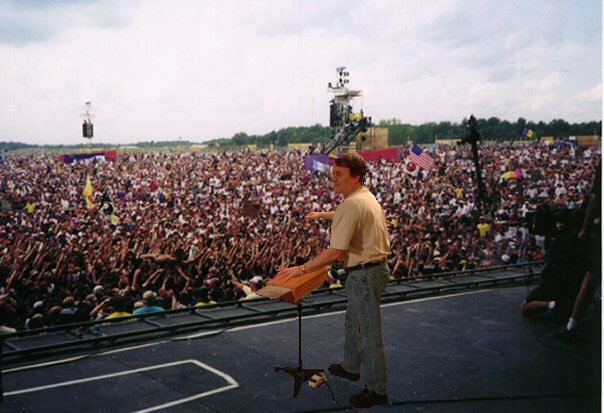 The keyboard player objected, and stated that he had never heard of, seen, or understood what a theremin was, and that we should just go out with no preconcieved concept, and go for it. We all had one more beer and headed for the stage, to play before 500 rock n' roll fans. The recording has some distortion at the beginning, as it was taken from a well used video tape. I performed March 1, at the Completly Plugged Concert. It was a great performance. 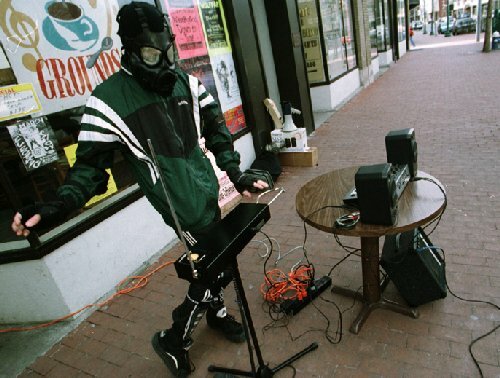 Myself on Theremin, accompanied by keyboards, bongo drums, drums, and saxophone. It was totally impromtu and improvised. It turned into a Desi Arnaz meets Pink Floyd type sound. Lots of delay effects on Theremin etc. It was fantastic. Cop: We're checking out a report of a man walking down the street with a strange piece of equipment under his arm. Cop: What is that thing anyway? Me: It's my Theremin. It's a musical instrument played without touching it. Then a truck pulls up, it's my neighbour. He asks me if I want a ride home. Cop: You know this guy? Neighbour: Yep, he's my neighbour. Cop: OK get him out of here. I don't want to see this type of thing again! Me: Whew, I thought they were going to take my Theremin. Arrived safely home a few minutes later.